Layers and layers of antiqued gold brass filigree embrace a rare, vintage Swarovski triangular Emerald Green crystal. Top filigree holds 1 tiny golden metal rose to symbolize Love. 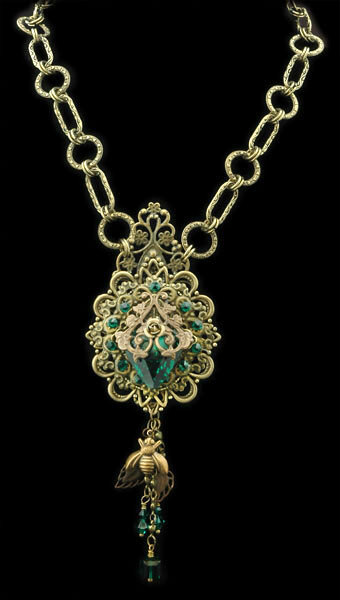 A tiny bee, brass filigree leaves and beautiful Emerald Green Swarovski crystals are suspended from this gorgeous pendant. The chain itself is a work of art, as each metal loop is delicately etched with tiny hearts or beautiful flourishes.